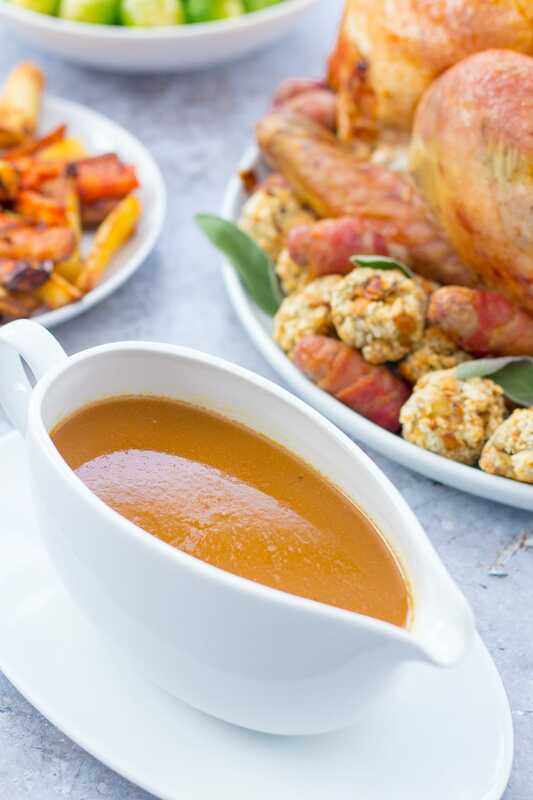 Want to make delicious Easy Peasy Turkey Gravy made from scratch – including making the stock from the turkey giblets? Then you will love this recipe! The turkey stock can also be made ahead and frozen – meaning one less job to do on Christmas day! Don’t throw away the turkey giblets! So you know that little white packet of turkey innards that you get inside the cavity of your Christmas turkey that most people throw away? DON’T THROW IT AWAY!!! There is amazing flavour to be had from inside that magic packet. 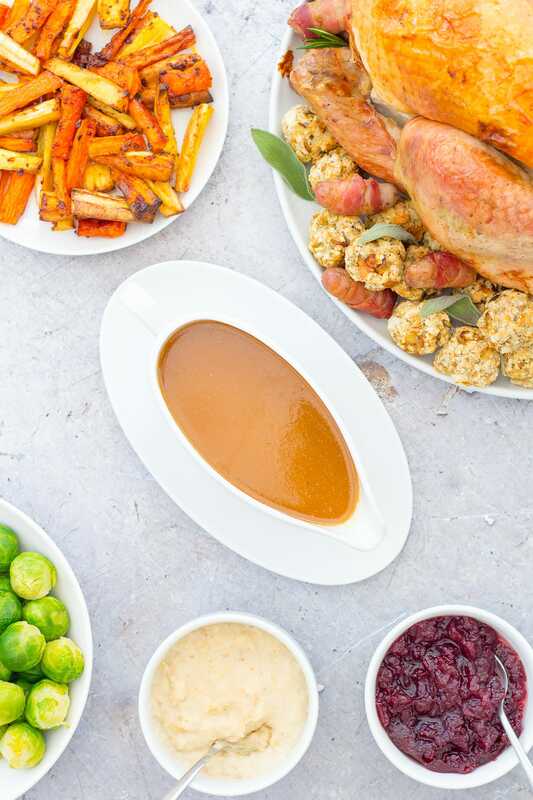 And the good news is that it can be turned into a delicious easy peasy turkey gravy in just a couple of simple steps. Fish it all out and pop it into a saucepan, along with some carrots, onions, peppercorns and herbs (for quantities see the recipe below). Simmer, strain and freeze (unless it’s Christmas Day, or very nearly, in which case pop it in the fridge). 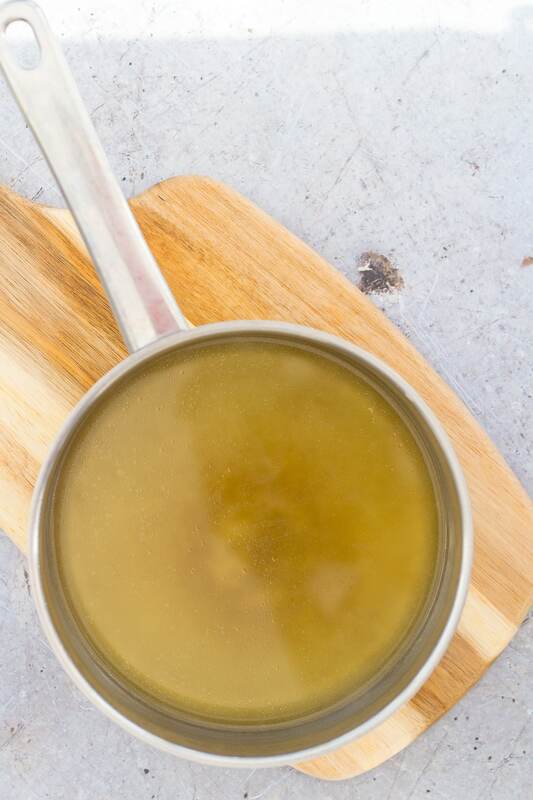 On Christmas day all you need to do is defrost your lovely tasty turkey stock (in the microwave, in a pan or overnight in the fridge – if you can find space!) and add it to the turkey roasting tray with a couple of tablespoons of flour, and you will have the most amazing turkey gravy, basically for free! Note, these days it is entirely possible to get a turkey without any giblets- so do check. If you want to make this recipe – you really do need some turkey giblets! What if you don’t have any turkey giblets? If you don’t have any giblets you can make stock from the carcass of a roast chicken instead. Follow the recipe below, but use a chicken carcass instead of turkey giblets. 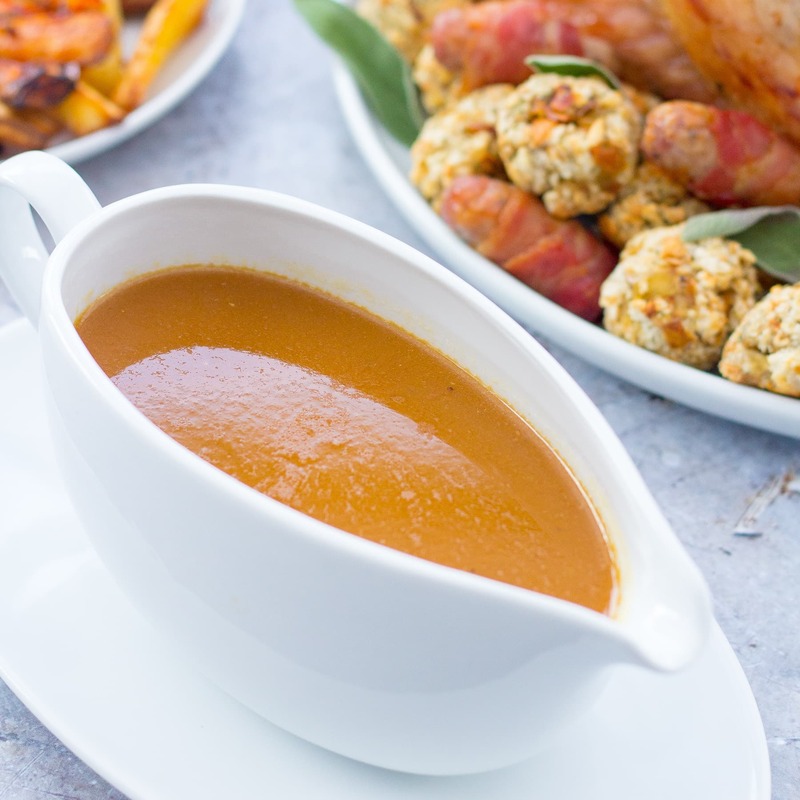 Making the stock for this recipe is super easy and involves hardly any work but if that is just one job too many for you in the busy run up to Christmas you can make the gravy in the recipe below using shop turkey stock, instead. 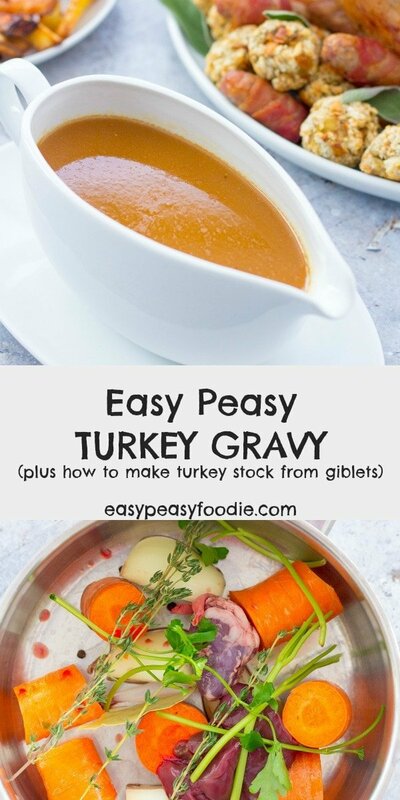 Want to make delicious Easy Peasy Turkey Gravy made from scratch – including making the stock from the turkey giblets? Then you will love this recipe! The turkey stock can also be made ahead and frozen - meaning one less job to do on Christmas day! First put all your turkey giblets into a medium sized saucepan, add the rest of the stock ingredients and put over a medium high heat. Bring to the boil, then turn right down and put a lid on. Leave to simmer away for 45 minutes. After 45 minutes strain the stock through a fine metal sieve into a clean jug/bowl/saucepan and discard all the bits left in the sieve – they have done their job. Allow the stock to cool to room temperature. Pour into an airtight container and freeze until Christmas Day. 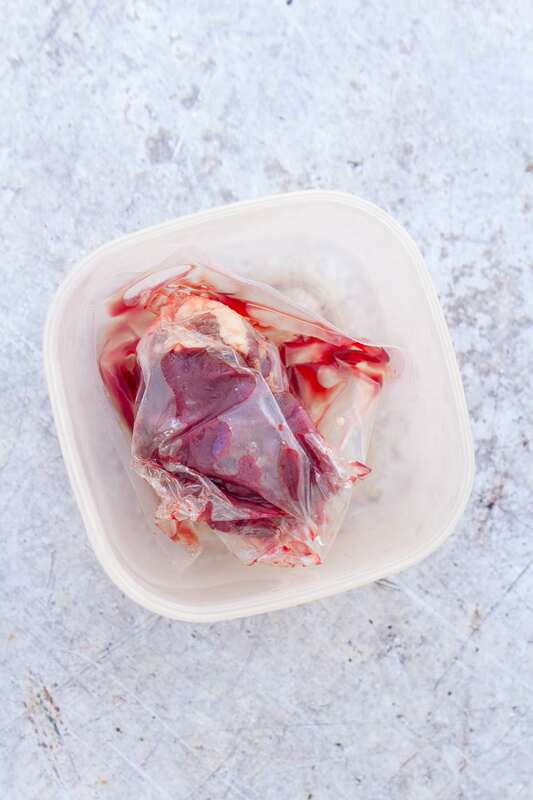 Defrost your stock for 24 hours in the fridge. Alternatively, you can defrost it the stock by zapping it in the microwave or just melt it in a saucepan over a low heat. When your turkey has finished cooking, transfer it to a separate tray or rack to rest, and put the roasting tray over a medium burner on your hob. Bring the juices to the boil and sprinkle over 2 tablespoons of flour. Stir well until all the flour has been incorporated, then tip in the turkey stock you made earlier. Bring to the boil, then turn off and tip the gravy into a saucepan. Bring back to the boil and simmer for 5 minutes just before you want to serve the gravy. You may wish to sieve your gravy for a smoother finish. If you are cooking a whole turkey on Christmas day, you can repeat the same process with the turkey carcass, after you’ve eaten your lunch, and you will produce some really lovely turkey stock to use at a later date in soups or stews or anywhere you might usually use chicken stock. It would taste wonderful in my Chicken and Chorizo Paella, Easy Sausage Traybake or any of my soups. If you are cooking a whole turkey on Christmas day, you can repeat the same process with the turkey carcass, after you’ve eaten your lunch, and you will produce some really lovely turkey stock to use at a later date in soups or stews or anywhere you might usually use chicken stock. Put your turkey carcass and add all the rest of the stock ingredients. Put over a medium high heat, bring to the boil, then turn right down and put a lid on. Leave to simmer away for 60 minutes. After 60 minutes, remove the turkey carcass and strain the stock through a fine metal sieve into a clean jug/bowl/saucepan. Discard the carcass and all the bits left in the sieve. Allow the stock to cool to room temperature. Pour into an airtight container and freeze until needed. 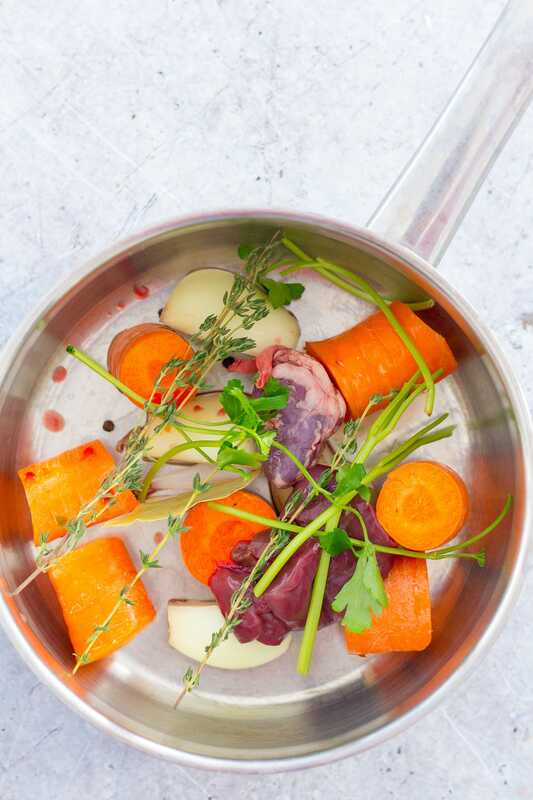 Defrost your stock for 24 hours in the fridge. Or you can defrost it by zapping it in the microwave or just melt it in a saucepan over a low heat. If you want to, you can simmer your strained stock for a further hour on a low heat. This will make a super concentrated stock that you can freeze in smaller portions (e.g. in an ice cube tray) and add to dishes in place of a stock cube. I am linking this up to Cook Blog Share and Cook Once Eat Twice. I think the gravy tastes so much better made with giblet stock, well worth the effort of making it. Gravy makes a roast so its well worth putting in the extra time. It’s very disappointing that not all turkey’s come with their giblets these days.